The 2017 Lehigh Mountain Hawks are known for having a great offense, a high-octane group that features stars like junior QB Brad Mayes and junior RB Dominick Bragalone. But senior WR Troy Pelletier would trade it all for conference wins. 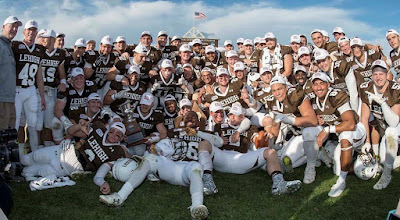 On an afternoon where he broke a bunch of school and Patriot League records – some of them unanticipated – his focus, as ever, was about getting the league victories that count towards the main goal of this team – to defend their Patriot League Championship. Fortunately for Lehigh fans, his banner day came to allow Lehigh to resoundingly beat Georgetown 54-35 and go to 2-0 in Patriot League play. It was a very different time for Lehigh football, but in 1966, the Engineers started out the season 0-5, and had to travel up to Hamilton, New York to take on the Colgate Red Raiders. “Lehigh faces its toughest opponent of the season tomorrow afternoon in the Red Raiders of Colgate, at Kerr Memorial Stadium in Hamilton, N.Y,” the 1966 Brown and White preview read. After their 21-15 loss to Colgate in 1966, the Engineers would fall to 0-6 and eventually finish 0-9 on the season, the last time Lehigh started a season 0-6 and the last time Lehigh would go winless in a season as well. 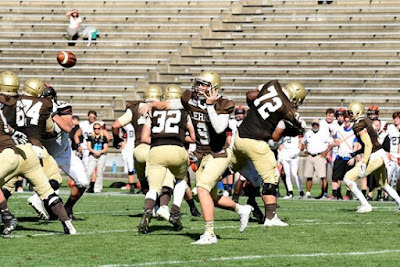 It was that sort of historic elephant that the 2017 Mountain Hawks had on their backs this Saturday, whether they realized it or not. Had they lost to their Chenango Valley rival, they would have been the first Lehigh football team to go 0-6 in more than fifty years. 0-5 entering this game, ironically their sixth shot at a football victory would involve going to the same venue to play the same opponent they played fifty-one years ago trying to avoid a 0-6 start. Turning around an 0-5 start could be one of the hardest jobs in football, especially against a hated conference rival, and especially in a place that has always been a difficult place for Lehigh to play. And it wasn’t easy. The 2017 Mountain Hawks had help, both from some tough calls against Colgate and from some boneheaded penalties against the Raiders that were justified. But this group of athletes achieved that goal that eluded the same goal of the Lehigh Engineers of 1966. The football team playing this Saturday won a hard-fought 41-38 contest that maybe, just maybe, might have turned things around just in time. It came as a big surprise to the press box, the fact that senior QB Nick Shafnisky would not be starting versus Yale. Sophomore QB Brad Mayes, who had seen time on the field as a freshman, trotted onto the Yale Bowl’s grass field to start the game instead. By the time he’d left the Yale Bowl’s playing field, he and the Mountain Hawks would have put their marks on a whole lot of Lehigh and Yale Bowl records. Combined, Lehigh’s and Yale’s 70 points would be the most ever recorded in a half of football at the Yale Bowl. 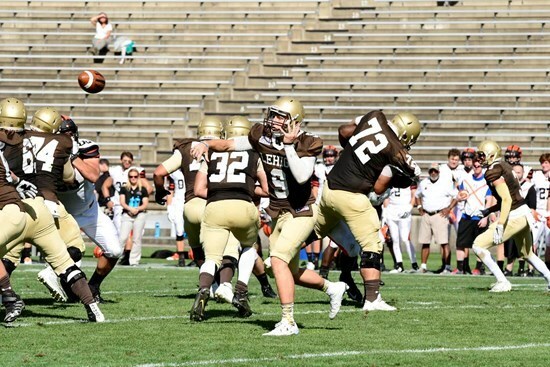 Lehigh QB Bob Aylsworth‘s record 454 passing yards in the Yale Bowl, broken. The all-time team and individual Lehigh records for passing yards in a game, broken. All-time touchdown pass record, tied. Most points scored by an Andy Coen-coached team, broken. Number of extra points in a game? Tied. Number of passing touchdowns in a game? Tied. Most points allowed by Yale at the Yale Bowl? Tied. 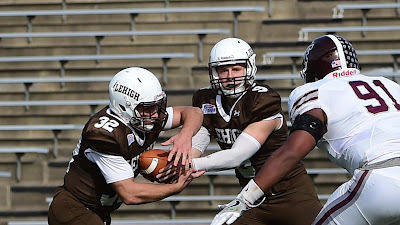 It was a 63-35 win that, incredibly, was still in doubt at halftime when a second half 21-7 surge would allow Lehigh to pull away and the records started to pile up, one after the other.